Each semester, American Marketing Association (AMA) UIC organizes site visits and office tours to Chicagoland companies for College of Business students and their members. These company visits cover details on digital media, retail, branding, and analytics industry advancements. They are organized to connect with senior leaders from local, national, and international companies. As part of our Fall ’18 semester plan, President, Rebekah Romack and executive board members of AMA UIC organized a site visit to PepsiCo’s Chicago Headquarters. On Monday, October 15th, 19 AMA UIC members attended a lunch & learn session at PepsiCo where four guest speakers presented details on different aspects of the company’s marketing strategies. They discussed details regarding how PepsiCo utilizes creative strategies to launch new consumer packaged goods. For instance, Aiden Kingerlee, GM Vice President of NAN Premium Nutrition, mentioned that LIFE WTR and Bubbly were two of his biggest launches in consumer-packaged goods. He emphasized how they ensure that their products showcase community and they offer a consumer positive experience. He mentioned the best advice he can give to young marketers is to surround themselves with individuals who have knowledge regarding digital marketing and analytics tools. Moreover, our members had the opportunity to ask insightful questions throughout the speaker’s presentation. When Avery Maxwell, a current member, asked Aiden how he responds to controversies for campaigns, such as the Kendall Jenner campaign’s, he responded by mentioning that although it is hard to deal with these issues, the company and employees accept their mistakes. Aiden’s presentation was followed by Erika Salgado, HIVE Founder at PepsiCo, who provided details regarding her career growth and experience with Pepsi. She discussed how she began her career as an intern at PepsiCo in 1999 in Brazil. She discussed how being productive rather than being occupied has assisted her in holding positions such as Marketing Director for Quaker Oats and Salty Snacks. This experience helped us gain insights on how to grow our careers in the business field after internships. During the speaker session, our members had the opportunity to interact with Carolyn Buff, Marketing Director of NAN Gatorade and Rebecca Kar, General Manager Senior Vice President for NAN Tropicana who provided insights on Gatorade branding strategies. It was a delightful experience for me to learn about the Gatorade Player of the Year awards. One of the speakers mentioned details regarding Gatorade Sports Science Institute. They mentioned how flavors are originated and discontinued in this research center. This provided our students with insights on how Gatorade manages their extensive product line. 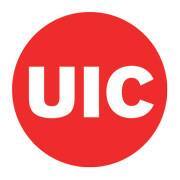 Furthermore, our UIC business students received advice on career growth. Carolyn Buff advised us to become more involved in business organizations during our college career as it assists in developing leadership skills. These marketing professionals advised us to value feedback from seniors as it helps in developing interpersonal skills for your future success in career. Aiden and Erika created an interactive session with students by presenting their career growth in PepsiCo. They suggested us to develop our resumes and tailor it according to requirements of different job posting and include a cover letter in job applications. They suggested building a network where people support you in learning skills that can be used in the corporate world. Thus, these company visits assist undergraduate students to understand what steps they can take to grow in the marketing industry. In summary, company visits like PepsiCo provide a remarkably distinct learning experience for our ambitious AMA UIC members. They provide an opportunity for students to connect with marketing professionals. By organizing such company visits, our members are given exposure to learning skills such as personal branding, consumer packaged goods branding, strategic thinking, digital media, and recruitment. Overall, these events show how UIC Business shapes their students positively and prepares them for their professional success. Zainub Ghias is fourth-year UIC Business Ambassador pursuing a Bachelor of Science in Marketing with a Business Analytics minor. In the summer of 2018, Zainub was a Business and Entrepreneurship intern at the Golden Corridor Makerspace and William Rainey Harper College. She currently works as a Communication Aide with the Physics Department and General Office Aide with Biology Department at UIC. She also serves as the Secretary of the American Marketing Association and Vice Chair of Marketing for Undergraduate Women’s Network.